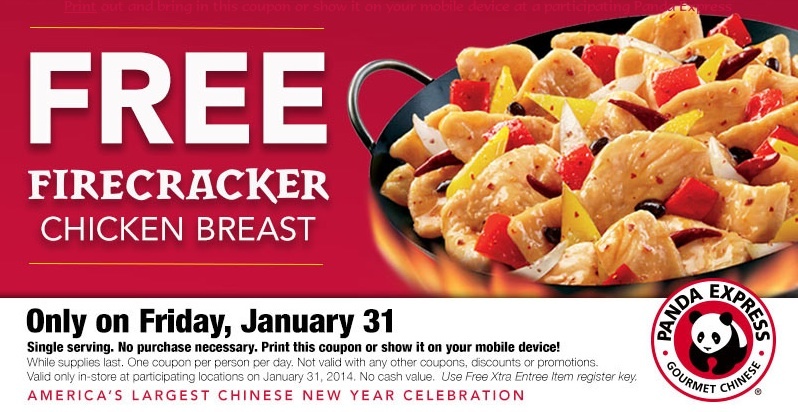 In celebration of Chinese New Year, Panda Express has a coupon available good for One Free Firecracker Chicken Breast Entree on January 31, 2014. Print the coupon above or show it from your mobile device. No purchase necessary. One coupon per customer. Coupon valid January 31, 2014 only while supplies last. Not valid with any other coupons, discounts, or promotions. This entry was posted in Concord, Lafayette, Pleasant Hill, Walnut Creek. Bookmark the permalink.